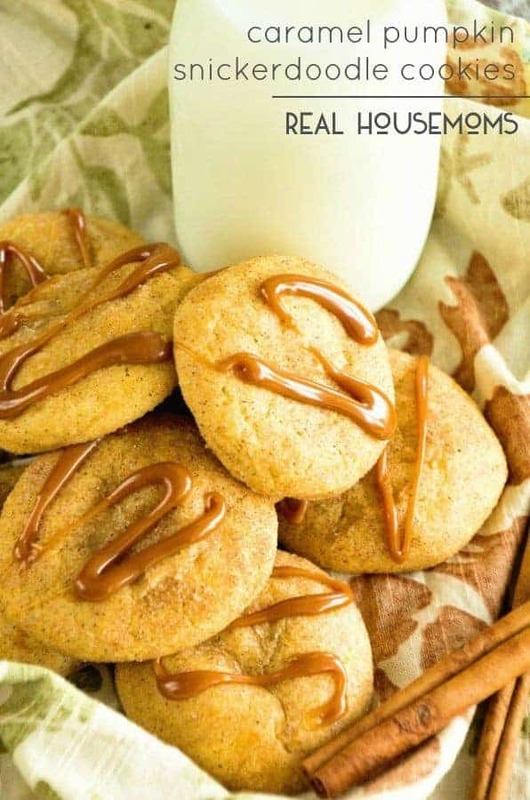 Caramel Pumpkin Snickerdoodle Cookies are the perfect fall time cookie! 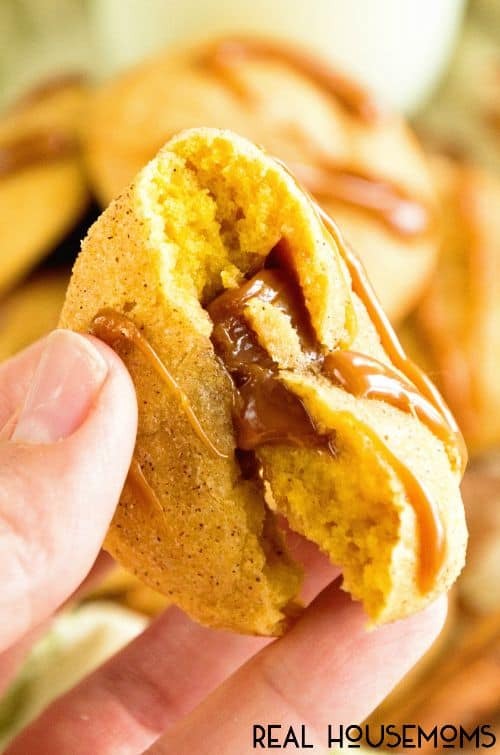 Soft pumpkin snickerdoodle cookies stuffed with caramel and then drizzled with caramel to top it off! One of the best features of my current home is my little front porch. As much as I would adore a large wrap around porch this one will do for now. Yes, I wish it was wider so I could fit some rocking chairs on it but at least I have one! The best part is decorating it for fall. It’s currently decked out in everything possible that I own or bought for the occasion. I also hit up my parents farm to rummage around and find some cool milk canisters and wash tubs to decorate with. My dad kept looking at me and saying, “What on earth are you going to do with this junk? ?” I just giggled and said I’m not sure. You see, I’m bad at this, even though I think it’s fun. I see the “junk” and I know there are so many endless possibilities, but after I have these prized possessions I struggle o pull it all together. Story of my life. My house kind of looks the same! The porch is sporting wash tubs with mums, fall garland, pumpkins and lights. You name it I’ve got it. I also made a cute welcome sign on a board that I was pretty proud of! My hubs even let me use is big old sander. That’s about the only time I’ve actually done something productive and in his shed! We live right by a busy highway so I keep waiting for someone to say how cute it is and so far just my neighbor has. Kind of defeating after all that work! Oh well, I get a smile on my face every time I see it so it’s all worth it. Besides decorating my front porch do you know what my other favorite thing about fall is? Baking season! It’s finally cooling off and there’s nothing better than warming up the house with oven full of treats. 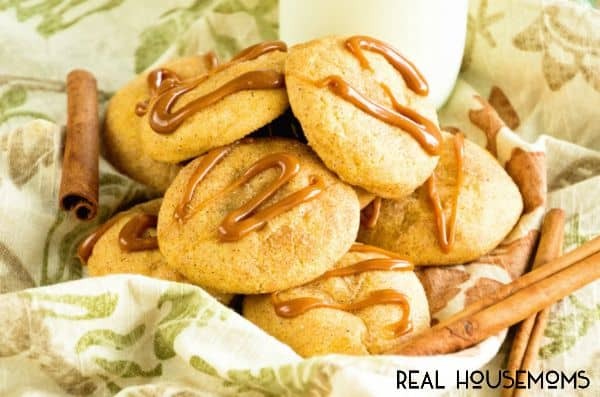 Especially when they leave your house smelling like cinnamon and spices like these amazing Caramel Pumpkin Snickerdoodle Cookies! 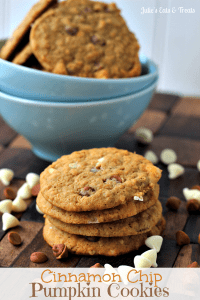 Grab a mug of hot apple cider and sit down with a plate of these cookies and everything will be right in the world again! Using a stand mixer cream butter until light and fluffy. Mix in sugars and pumpkin puree until combined. Add egg and vanilla, mix until combined making sure to scrap the sides of the bowl. In a separate bowl whisk flour, baking powder, salt and ground cinnamon. Beat this mixture into the liquid mixture add a little at a time until it is all combined. Cover dough with plastic wrap and chill a minimum of one hour. Preheat oven to 350 degrees when you are ready to make the cookies. Line your baking sheets with parchment paper or spray with non-stick cooking spray. In a small bowl combined the cinnamon sugar mixture for rolling the cookies in. Remove the dough from the fridge. Using a medium size cookie scoop, scoop out the dough and roll into balls. Place a caramel in the center of the ball and form the dough around it so it is completely covered. Roll in cinnamon sugar mixture. Place on baking sheets. Bake for 12-14 minutes or until they are slightly firm to the touch. Let cool on baking sheets for 5 minutes then remove to finish cooling on baking racks (about 1 hour). Place the caramels for the topping in a small microwave proof bowl and melt the caramels in the microwave. Drizzle over the top of cookies. If you need to thin the caramel for drizzling add a small amount of water or milk until it reaches desired consistency.